tions are horizontal, while in the outer three on both sides the vibrations are vertical. An idea of the power of this instrument can be obtained by comparing Fig. 81 with Fig. 80, which gives the appearance of the line as seen in the best grating spectroscope. 1. 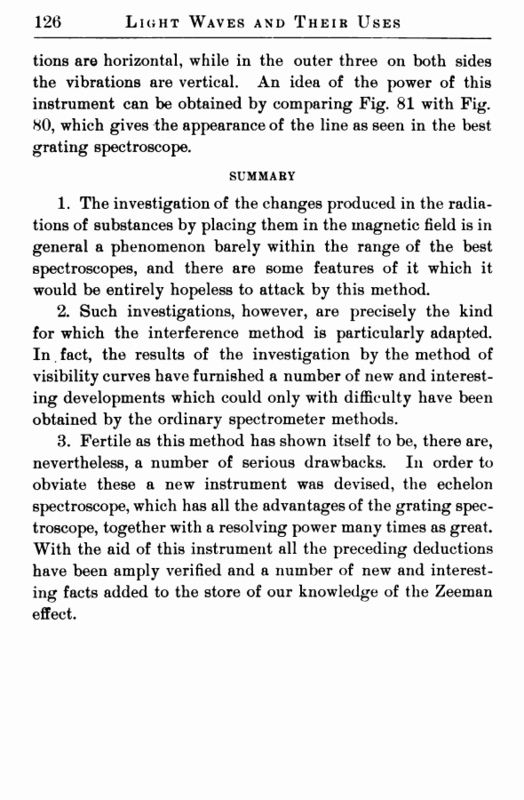 The investigation of the changes produced in the radiations of substances by placing them in the magnetic field is in general a phenomenon barely within the range of the best spectroscopes, and there are some features of it which it would be entirely hopeless to attack by this method. 2. Such investigations, however, are precisely the kind for which the interference method is particularly adapted. In fact, the results of the investigation by the method of visibility curves have furnished a number of new and interesting developments which could only with difficulty have been obtained by the ordinary spectrometer methods. 3. Fertile as this method has shown itself to be, there are, nevertheless, a number of serious drawbacks. In order to obviate these a new instrument was devised, the echelon spectroscope, which has all the advantages of the grating spectroscope, together with a resolving power many times as great. With the aid of this instrument all the preceding deductions have been amply verified and a number of new and interesting facts added to the store of our knowledge of the Zeeman effect. Our knowledge of the heavenly bodies is still very limited. The little that we have learned has been acquired almost entirely with the assistance of the telescope, or the telescope compounded with the spectroscope. Without these, the stars and the planets would always remain, even to the most perfect unaided vision, as simple points of light. With these aids we are every year adding very much to our knowledge of their constitution, their form, their structure, and their motions. 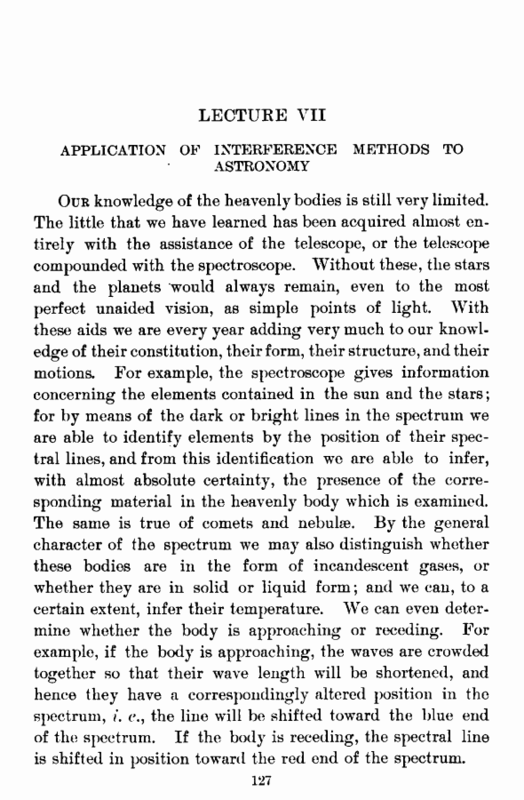 For example, the spectroscope gives information concerning the elements contained in the sun and the stars; for by means of the dark or bright lines in the spectrum we are able to identify elements by the position of their spectral lines, and from this identification we are able to infer, with almost absolute certainty, the presence of the corresponding material in the heavenly body which is examined. The same is true of comets and nebulae. By the general character of the spectrum we may also distinguish whether these bodies are in the form of incandescent gases, or whether they are in solid or liquid form; and we can, to a certain extent, infer their temperature. We can even determine whether the body is approaching or receding. For example, if the body is approaching, the waves are crowded together so that their wave length will be shortened, and hence they have a correspondingly altered position in the spectrum, /. the line will be shifted toward the blue end of the spectrum. If the body is receding, the spectral line is shifted in position toward the red end of the spectrum.